The pit of the avocado I am eating right now for breakfast is the largest I have ever seen and eerily resembles a dinosaur egg. I want more creamy goodness for my money, not a giant ball of useless that is proving far too difficult to pry out with a spoon. I think I have finally found a way to eat that fits both my budget and my distaste for the dining hall. I will cook fresh pasta every Tuesday and Friday. If I make new sauces every night for it, I will never feel like I am eating the same thing too much. Occasionally there will be chicken salad or meatballs. And for breakfast, I will eat as much fruit/vegetables/toast with jelly as possible so that lunch is an afterthought. I managed to avoid the dining hall almost entirely last week, and that was only on two quarts of wonton soup. If I cook, I will be even better off. Of this much I am sure, it is time to compile a list of recipes. Tomorrow is my last day of classes for the week already. Yom Kippur conveniently extends my October break, a week(ish) off that I will use to watch as many movies as possible, have a dentists appointment, and write a paper that is due Friday. When I go back to New Jersey for the day on Thursday, I will most likely steal two weeks worth of groceries from my family's pantry. I swear to god, my grandma grocery shops as if there is an impending nuclear holocaust. French press coffee is delicious. 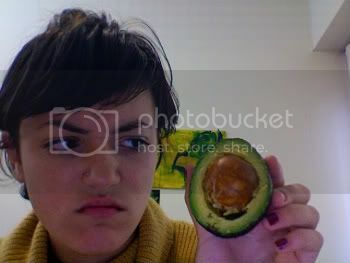 pretzels and peanut butter are delicious, avocados eaten out of their skin with salt and nothing else are delicious. I am getting very used to all of this.